Good to know: The sequel to Matched. This series is going to be a trilogy. 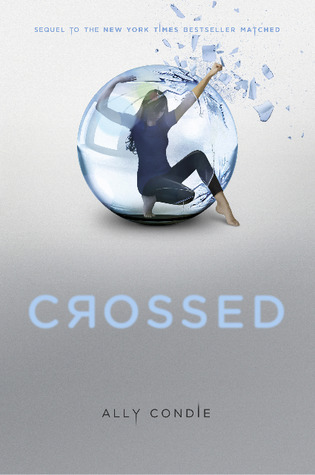 I had high expectations for Crossed since I loved Matched so much. I liked this book too, but it did not live up to my expectations. Cassia finds herself in a whole new place, and she begins to search for Ky. Ky, on the other hand, is doing his best to survive and he manage to find new allies and friends. Condie has a beautiful writing style and she is one of the best writers in the Ya - universe. Her writing is poetical, with a few words and sentences she is able to say so much. Sometimes I just stop my reading and reflect over something she has written. There are so many great quotes, so many good observations. It is simply a joy to read. Because in the end you can't always choose what to keep. You can only choose how you let it go. Love changes what is probable and makes unlikely things possible. My biggest problem with this book, is that the story is too slowpaced. It takes too long before there is any real action, and once the book was finished I still had a lot of questions that were not answered. I longed for more. More information about the Society for one. Loving him gave me wings and all my work has given me the strength to move them. The narrative in the story shifts between Ky and Cassia. I liked that, since I felt we got to know each of them better. But what surprised me was that I felt a lot more sympathy towards Ky, he is a much more complex and interesting character than Cassia - at least in this book he is. Even though I felt the story lacked something, I will still recommend the book. The writing style is, in itself, something that should make you read the book. I hope I will get more answers in the third book, because I will read it. I cannot get enough of Condie's prose. Visit the Matched trilogy here. Like you, I really liked it but I dont think it was better than the first one XD. I'm waiting for the series to end to read all three books at once. I'm finding the one year wait for all these books to get be daunting and I end up disappointed. I am looking forward to reading it though.